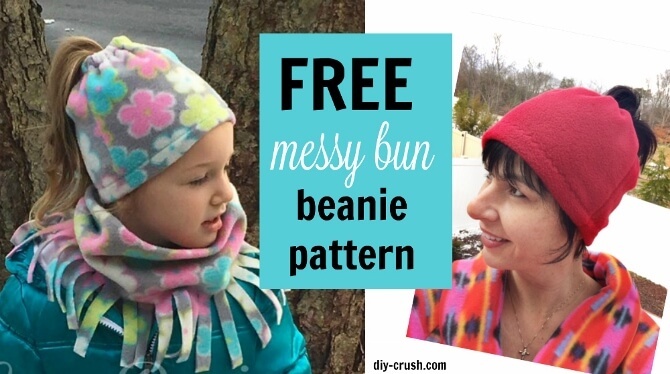 Sew a cute and comfy beanie that accommodates your messy bun (and ponytail)! 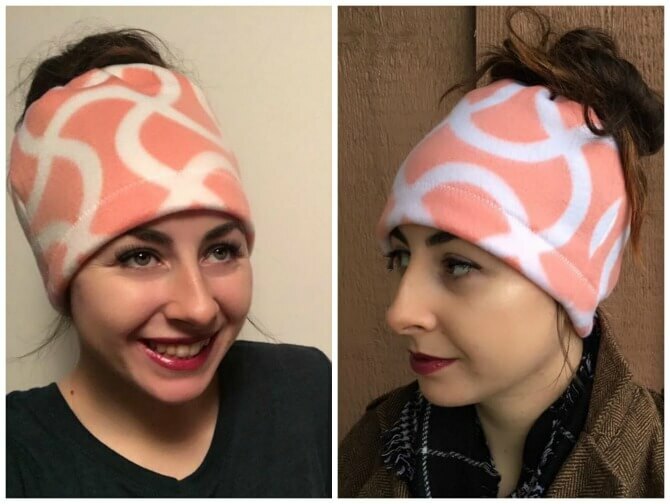 Learn how to make a messy bun beanie today and whip some warm hats up in 15 minutes flat. These beanies are great scrap fabric busters and make lovely gifts for kids and women who love to have their hair up. *This post contains affiliate links. Please see full disclosure here. Winter is well in progress here in the D.C. area and I am just obsessed with all the amazing fleece I recently purchased. It’s definitely time to get sewing now. A dear customer approached me with the idea of making a ‘messy bun’ beanie pattern! I have seen messy bun beanies on Pinterest more often now but they were all either crocheted or knitted. Now with me being a fleece addict I thought immediately to whip one up with fleece. So I made up 3 size groups which will fit kids ages 6 & up plus women. They are so easy to make too! And fast! Fabric requirements: only stretchy fleece, no cuddle/minky fabric unless it stretches a bit. If using knit fabric you want to take off 1” of the width. *if you are watching this video on my blog then please disregard the link mention in the video. I hope you have enjoyed this video tutorial on how to make a messy bun beanie and will make a bunch now too! If you do, please share the pics in our facebook group! I can’t wait to see all your cute messy bun beanies! Check out our Free fleece patterns & tutorials <====== click this link! BTW, if you are in the fleece hat making craze, I can highly recommend this book! It has over 25 most adorable fleece hat designs to sew. Hi, love the messy beanie but can’t seem to be able to download the pattern. I would love to make it since I wear ponytails and messy buns. Thank you for checking out this post! There is no downloadable pattern. It is a video tutorial and the cutting chart for each size is right above it. Is there a pattern for the fringed scarf worn by the little girl wearing the grey background with colourful flowers hat and scarf? No, but it’s easy to make. Just cut a long piece of fleece, about 10″ wide. Then cut the fringes along one of the long sides. Leave an uncut allowance of 3″. This is such a great idea, Denise! Long hair, ponytails and hats don’t always play well together. You’ve solved the problem. I’ve showcased your fab solution. I’ve just tried to make myself and my daughter matching bun hats, and following your measurements I can’t even get the hat on our heads. I tried the adult on her (she’s 8) and it was too tight. I can’t even get the elastic around my head. This was a great idea, but some of the measurements seem off. What are the seam allowances? Which side are you sewing, the 9.5″ or 11″?